I decided it was time to sit down with my inner-planes mentor of many years -ThothHorRa – and ask some pertinent questions concerning the major shift we are now individually and globally experiencing…which needed to include something about our origins as a human species. Since 1967 and directly from Thoth, since 1977 – I have received a great deal on all of this, but piece-meal. It is scattered through years of my material. And there were a lot missing pieces. So the following is my attempt to gain from Thoth a brief overview of it all. This is not my any means, a complete picture on these topics. I imagine a book could be written in answer to each of the questions presented below – but not likely by me lol. I know there are other “channels” out there who have said a great deal about these topics – some agree with my akashic-Thoth insights and some do not. ‘Tis the way of the world. Each person must come to their own conclusions. Maia: Where do human beings come from genetically? 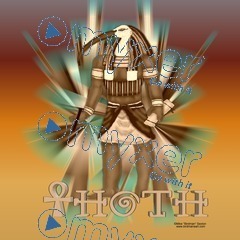 Thoth: They are presently a combination of star lineages and genetically bred homo sapiens. Maia: In brief, how did they come about on this planet? Thoth: Originally worlds from Rigel in Orion seeded the higher realm or “LOTUS” of what is now Earth. They developed from plant-jellyfish-like (in appearance – yet high spirit) beings into more human-like forms. They descended into the LOTUS through the Inscription of Light for Earth. Each world domain contains an Inscription of Light, which is co-signed within all elementation of that world’s domain (planet). The Kadmon Template is the true human design, out pictured from the Earth’s Inscription of Light. It is from this Template that the first LOTUS humans developed into more human-like beings. This was an intended process, but in order for it to occur, the envelope of Light of this planet had to change – to become less shall we say, etheric. At a certain moment of vulnerability, some of the Children of Light existing in the ether of Earth impulsed to build a more physical creation within it. Understand, that what you call “physical” is simply a more magnetic energy within the Universal Hologram. It draws strongly upon “souls” to create, to form, to develop out of the “clay.” Some of the Children of Light were sorely tempted to move deeper into the creation in the clay. While others intended to hold a creational matrix within the LOTUS and not move into the deeper levels of elementation. This created a division of world envelopes. Those who chose descent into matter had to separate from the Inscription of Light into order to create a sub-template for their own purposes. Yet the could not truly eradicate the Inscription of Light for it is still there – largely dormant in the DNA. We use this Biblical term as it comes from the Hebraic Nephesh or Elemental Soul – that part which returns to the Earth after life transition (death), while the spirit soul ascends into the next revolution. The Nephilm were incarnated beings in human-like forms – from other worlds. They arrived in merkabah star ships. This story has largely been told, associated with the “Annunaki” of Sitchin Lore. Much of this telling is correct, some is not…but much more is simply missing, and therefor the larger perspective cannot be attained until more of this history comes forth. The Nephilim chose the role of separation, yet some have come through that fire and are now working to clear this action. Thoth: No. They feed that elementation. They dwell upon it and work through it. They are not of it. Beyond the Hebrew Nephesh is the Atlantean Neph’El – those who borrow the Elemental Souls to do their bidding. This is another topic, but in Atlantis there were dis-incarnate beings who would take hold o f Elemental Souls, once the spiritual soul had transitioned. They would then use the energy for a period, until they could no longer operate within it. They could only use the Nephesh that had not been nourished by the spiritual soul. Those nourished are strong and vibrant. This all took place toward the end of Atlantis as it succumbed to a darker influence and caused certain portals to be opened that should not have been undone. Back to the topic of the Nephilim . . . Yes, as the “Annunaki” they did create a genetic “slave” species, but this species was not the human you are today. However, some Annunaki wished to correct this wrong by uplifting the slave species and giving them the Seed of Light through their own genetics. These are the Phree-Niphilm we speak of that turned back toward the Light…opened their Inscription (of their planet) and poured it into the Earth slave species. But that was not the final transformation. Also on this Earth from out of the LOTUS came the Ones from Orion – Rigel and other true stars of that space realm, as well as their Kindred from the Pleiades and Sirius (and some other of the Kindred).These beings encouraged and aided the Phree-Niphlim to re-generate the Earth’s Light program, and in the process, so they also, injected their DNA into the forming “human species” of Earth. Maia: Tell me more about the beings who carry out their agendas through what you call the “Architects” – or are they the Architects themselves – who really are the Architects? Thoth: The Architects are very ancient in the Earth. As “beings” they developed in the Epoch of Eros – the Time of Substantiation. They were at first, a mix of star seed and elemental (realm of faries, nomes, etc). They broke away and formed their own evolutionary pod. They chose to live underground in caves (which were much more vast and closer to the surface in those days). They were highly intelligent, but became more and more focused on what you might now call “personal ambition” but could be seen also as a survival of the incarnated condition and associative world focus. As time passed, they began to come to the surface of the planet, but lived a part from the masses. Their hearing is acute, and in the darkness their eyesight is also, but their eyes are very light sensitive. The Architects developed a propensity and talent for building, developing, creating things of the world….which they will sustain and guard at all costs. Eventually they inter-married with the more “human” beings…but this did not occur frequently until about 6000 years ago. It wasn’t until the 17th century however, that they began to truly take hold of the world dimension, building and controlling physical empires within it. The Architects have also created their own sub-family that is part of the human race. This breeding is always very selective – often unbeknownst to those whom they choose to breed with. They wish to integrate a certain amount of active Light genetics, but carefully paired with the K’alaba, as they call it – the “Righteous.” This is a false Righteous. To them, it means those who stand by the Law they created eons before. A Law of “Right to Rule.” Their doctrine follows alongside Hebraic-Christian Doctrine. It strongly influences Christian Doctrine today and to much extent, controls it…both Catholic and Protestant. There are those “Off-World” entities who influence and aid the Architects in their world agenda. This is not a topic we wish to elaborate upon at this time. Maia: At this juncture, I just have to ask about the new Pope Francis. He seems like a true Apostle of Light. Why is he being allowed to be the Pope and say what he is saying to the world? Maia: All the seemingly bad and scary things happening now for the Earth: Fukushima radiation, GMOs, genetic manipulation…how should we be perceiving this? Thoth: Everything that is happening on the Earth is leading to the next level of spiritual fulfillment. Radiation is not “bad” – it is part of nature. All living things on this planet will adapt to the changes the Earth is undergoing. In the process of such change, there will be a change of “skins” – of outer form – what you call death and mutation – but this will pass into a beautiful transformation. The mutation of food also, will lead to a purer substance for the body, in that humans will turn to a means of energy for their bodies that takes them away from genetically modified and polluted foods. Maia: Why do many people – including myself – feel more and more an unreality in this current time frame…as if we are already in the New Earth? Thoth: The Hologram is shifting for Earth and it’s inhabitants, It is transforming into the New Earth Hologram. The more this shift occurs, the greater it bears upon the senses and becomes “real” to the perceptions of human cognition. When the senses attempt to compare this new reality with what they see and hear around them, the latter seems the more dis-associative to them. It is fading away and being replaced by the hologram of the New Earth. Maia: How can we continue to be present with the present and yet stay connected to the New Earth that is now merging into our beings? Thoth: Do not resist the process. The human logica is in place to hold on to “reality” – to retain rational thinking through adhering to the status quo. “Up” is up and “Down” is down. It is like the inner ear – if you upset it’s referencing, your whole world spins out of control. It will take some time to adjust, but the referencing will change gradually so that you can still operate in the old and the new assumes the “Real” for you. Relax into it, and you will become more mutable with the transition – ride the wave instead of struggling against it. Maia: What is happening, will happen to the large majority of the population of this planet that is still so asleep to the reality of all this coming upon us now, and sweeping us toward a disintegration of the Old Earth as the New Earth Star Hologram assumes the planetary spectrum? Thoth: They will pass from the incarnational cycle of the Earth into one which that matches the frequency they choose to remain in. This means that they will begin to have much shorter life spans in current embodiment. However, there will be those among them who will Awakening suddenly – as if from a bad dream and become Candlelights for the world. CONCERNING MATERIAL I PRESENT: When reading any “channeled” information (including mine) always bear in mind that it is being received through a human personality, and thus the interpretation of the pure energy streaming will be colored in varying degrees, by the “lens” of that person. In viewing these videos or reading the articles one needs to think and more importantly – feel for themselves, what among it all resonates for you and what does not. Please Follow Me on PinInterest! The whole Enchilada from Thoth (more or less). Thank you/ There is no doubt that The FLAME has returned. Again..wonderful, and refreshing to see someone express that the old paradigm – the logic – is just that, constructs and patterning of the old mind. [ continually perpetuated by the ‘individuals’ repeated thought process. Old construct – Human dominated by thought. New construct:- illumined mind, the Christic mind. The tired and worn out human constructs face annihilation in the face of the light/Flame. From the centre of the heart so the violet flame arises [transmutation] and integration into illumined mind, the Christic mind, and the mind of ‘God’. I found this information very interesting and indeed enlightening! Thank you. 1. Radiation is not “bad” – it is part of nature. 2. Their symbol will be a black candle lit with a Violet Flame. They will arise then, as the Napha’La, meaning in essence, “those who return the Flame of the Light Bearer (Luce’I’Faer) to the world. 1) Radiation is a natural state in the universe. What they DID at Fukushima (and are doing) is crazy-self-destructive, the radiation itself is not an evil enemy. It is only physically harmful to us because we are not at a vibrational level that can accept it. Thoth is indicating this will change. 2) “Lucifer”is a name which means “Light Bearer”. According to Thoth the origin of this Biblical mythos is a true Archangel that “fell” or separated from the Field of Presence, causing a certain dischord. This “Archangel” (a whole talk could be given on what “Angels” and “Archangels” really are) is the “Twin Ray” of the Christic Archangel which entered into I’shoa (Jesus) at the time of his Baptism. These two Archangels are meant to come back together in parity. Loooong story! So “Lucifer” must return what he has taken…the Flame – to the world. All this is put into highly metaphorical terms since it is either beyond human comprehension or involves a whole new level of science that would be mind-boggling. Maia, your info is so enriching, time and time again, many thanks for playing your part in it ! Thanks Maia! This is obviously important right now – to better understand our origins as it’s something I’ve been asking about too. Like always, you’re my go-to person and this overview fills in some of the gaps. Thank you so much Lotus! Really…your support and that of others gives me inspiration to keep going! Next Next post: NEW EARTH Life Pulse!